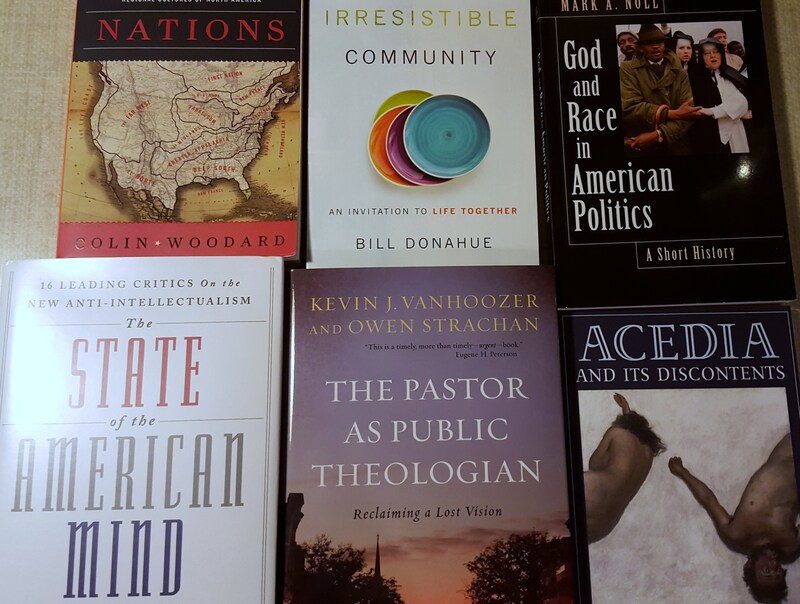 Some books I got for free–look for reviews here! It is only shameless to borrow ideas if you do not give credit. I came across this idea the other day on the blog site of another book blog, Fiction Book Review. Citra posted fifteen ideas for non-book review blogs. There were several ideas I really liked so you might see my own take on these in coming weeks. Of course the library is the most economical option of all. You don’t even have to think about storing the book after you’ve read it. There are a huge number of books available via Kindle, Nook, Google, and other sources like Project Gutenberg and the Christian Classics Ethereal Library that are free because they are in the public domain. There are also some free new releases–although I won’t vouch for the quality of those! Amazon Prime members get to select one free new release for their Kindle reader each month. Borrow (and return!) books from friends. Most friends are glad to see their books get a second reading and if you return them (unless they explicitly give the book to you), you are likely to be able to borrow more. Hang out with people who give away books. I’m one of those and I am good friends with others who do the same. Recently, I was at meetings where a speaker (and friend) was giving away books on race and ethnicity. I picked up two after waiting for others to grab them! Enter book giveaways. BookRiot and Goodreads are two sites I know who routinely give books away. Review books. If you are an established reviewer (with a blog or other review platform), you can request books for review, sometimes in print and often via e-galleys on Netgalley and Edelweiss. You must be prepared to read them in short order and write a review and usually post it not only on your blog but on commercial sites like Amazon. All these are in the category of free. Sometimes, you may need to pay a little to acquire books you want, particularly if they are recent releases. Friends of the Library book sales. Often books are for sale for $.50 or less, and many times at the end of the sales you can buy as many as you can stuff in a bag for $5 (or whatever ridiculously low price they set). And the money supports the library. Only danger is buying books you’ll never read in large quantities. Thrifty Christian Reader is a site that posts the latest deals on e-books both from a Christian perspective, and other worthwhile literature. Recently I learned of a sale of University of Chicago e-books through them. I hate paying full price for a book. Often at places like Barnes and Noble, you can find books on sale, and combine sales prices with coupons and membership discounts. Last year, I bought Thomas Piketty’s Capital at under half price new. Of course there are various online booksellers from Amazon (you can find them) to ABE Books and Half.com (now under eBay). Many of these connect buyers with third-party sellers, often selling out of print books at reasonable prices. Develop a relationship with a bookseller who stands for things you stand for. I admire the work of Byron Borger and Hearts and Minds Books. He offers discounts on featured books, though not usually as deep as the big booksellers. I’ve bought some of these and always have been happy with the books and the speedy shipping. This last won’t save you a ton, but what you spend will not only allow you to acquire books you want but to invest in booksellers you believe in. Perhaps the real issue is that when you get good at this, you are tempted to acquire (hoard) far more than you can read. But that is for another post!